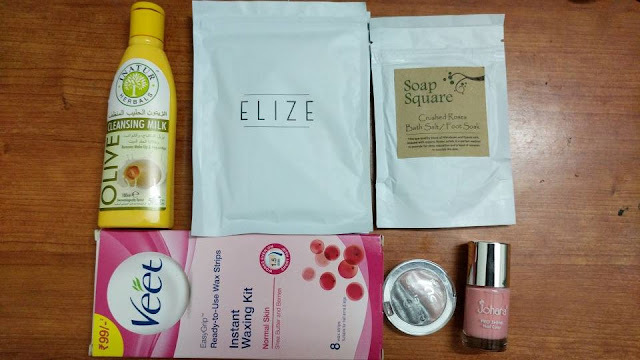 Here is the review of May Fab Bag. The theme is 'The Beauty Trippin'. The Fab Bag contains some of the best beauty and makeup products to keep you looking and feeling best during any adventure in this scorching heat. May is the month when everyone thinks about vacation eve though it is summer. The total number of products is 6 and the total value comes around Rs.1200. The 1-month fab bag subscription is available for Rs.599. You can also avail the most popular 3-month subscription which costs Rs.1599. What's inside the May 2017 Fab Bag? Johara Pro-Shine Nail colour Full size 10 ml worth Rs.250. Veet Ready To Use Was Strips for sensitive skin - Rs.99 for pack of 8 strips and 2 perfect finish wipes). Essence 3D Eyeshadow(Silver and Pink) Full size worth Rs.349. It gives a good finish with a 3D effect from satin to metallic shimmering. With its special relief structure, it gives a beautiful 3D look. The eye shadow is quite soft. It is quite easy to apply as it blends easily. I got the full size Pink-Youth shade. Pink is my all-time favorite and the name of this blog stands for it. With top quality formula, this nail color is long lasting. It dries very quickly when compared to most of the nail colours. It gives an eye-catching shine with its high quality pigments. This nail colour is available in 14 different colours. It is a blend of organic rose petals, rose oil, Himalayan and Epsom salts which gives spa quality. It is enriched with organic flower petals to help you provide deep relaxation and a feast of minerals to nourish your skin. For Foot Soak - Just place 2 -3 heaped teaspoons into a bowl of water in your preferred temperature. Soak your foot for 15-30 minutes. For Bath Soak - Fill a a bath tub to your desired depth and temperature and place 4-5 heaped teaspoons of this salt while the water is running. I got a full size bottle of Inatur Olive Cleansing milk. It is a soap-free creamy and nourishing cleanser. It helps you to replenish lost moisture. It also helps in removing impurities and stubbon make-up. It suits all types of skin. This olive cleansing milk is enriched with organic oil. Olive oil is known to prevent blemishes, skin nourishment by opening blocked pores and gentle cleansing. You have to just apply a little bit of this cleansing milk on cotton wool and gently clean with upward and outward movements. Inatur Olive Cleansing milk is so effective as it contains the following ingredients. Chamomile - contains anti-allegic properties, calms and soothes the skin. Geranium oil - prevents untimely sagging by tightening of the facial skin, combats anti-ageing symptoms. Lavender - tones and firms your skin, boosts circulation. These sanitary pads are from Indian brand called Elize. Elize is a menstural hygiene care brand in India. Each pad costs Rs.50 and comes with a ziplock for hygenic disposal. What I like the most about this product is it comes with a soft cotton top sheet. It also comes with bamboo charcoal anion strip to kill unpleasant odor. This kit comes with 8 wax strips. There are different variants for different skin type. As mine is normal skin which I have given in the record of Fab Bag, I received the one for normal skin. With shea butter and berries, the kit works great on hairs. May 2017 Fab Bag is one of the best Fab Bags in this year. With a total of 6 products, this month's fab bag cannot disappoint anyone. The total value of the products comes around Rs.1200 whereas you have to pay just Rs.599. You get 3 products in full size. My favorite products of this month are Inatura Olive Cleansing milk, Johara Nail colour and foot soak from Soap Square. Go and grab the fab bag at www.fabbag.com. How to plan a vacation with twins or multiples?